Since its formation the KCO has played a wide range of orchestral music, from baroque and classical, through the Romantic era, to contemporary music from the last century. We aim for a balance between the familiar and the new, and have a long tradition of first performances of music by local composers, often of astonishing inventiveness and musicality. Our conductor, Andy Meyers, is also an accomplished composer and we have premiered many of his works to great success. As well as performing three concerts a year in Kingston, we have also travelled abroad to perform in France, Belgium and the Netherlands. 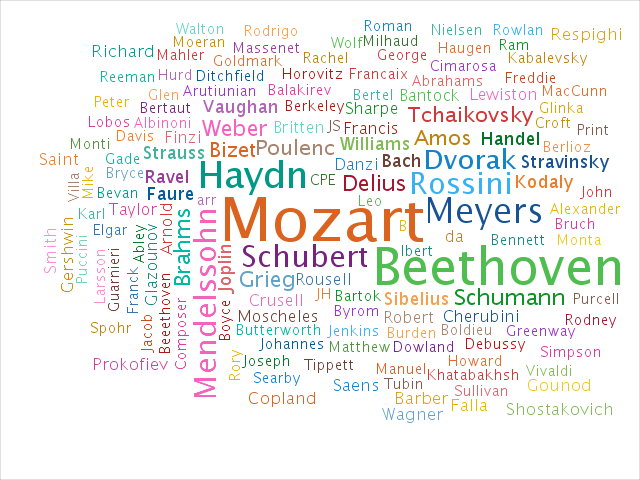 The "word cloud" to the right shows the composers that we have performed most often. Click here to view our recent performances. The Kingston Chamber Orchestra has performed a number of special commissions and first performances since its inception.